This is a privately owned unit and guests are renting directly from the homeowners whose company name is Gerry Main (as will appear on your credit card statement). Therefore your reservation is non-transferable between other properties. Your on-island contact is Graeme D. Merrin, RB, ABR, GRI 808-82-0272 for after hours emergency only (808) 651 7211. Resort Fees:HANALEI BAY RESORT WILL CHARGE YOU $20 PER DAY FOR RESORT USAGE. THIS INCLUDES POOL TOWELS,AMENITIES AND WIFI. THERE ALSO IS A $6 PER DAY PARKING FEE PER CAR. THE GUEST IS RESPONSIBLE FOR PAYING THESE CHARGES WHICH ARE DUE AT CHECKOUT. Resorts that require “resort fees” for guests staying on the property solely make the decision on what the amount of the fees will be and it is out of the control of the owner of this property. These fees are subject to change at anytime without notice and could change before your arrival and could be different than the original fee stated in your reservation. We make every effort to communicate changes in fees as soon as we are notified. Per County regulations, the lockoff units no longer have cooking appliances. Even though you may have had them in the past, they are no longer available and this is beyond our control. Amenities provided by third-party vendors (for example utility companies or subcontractors) are beyond our control. We do our best to provide services such as cable television, internet, and resort telephones. Should these be unavailable for part or all of your stay we will do our best to help restore services, but ultimately cannot be held responsible. Should you absolutely require internet access we recommend you make arrangement for these services through a cell phone company. The regular occupancy for 1205 is 2. The regular occupancy for unit 1206 is 4. The regular occupancy for 1205/06 is 6. Guests are obligated to disclose the actual number of occupants prior to arrival. A pack-n-play and booster seat are available at no extra charge, but must be requested via email to alohacondos@vacationrealtyhawaii.com at the time of booking or with reasonable notice prior to arrival. If more than one is needed, then it is up to the guest to rent one from a local rental company. We provide sheets for each bed and two bath towels per stated guest. There is no daily housekeeping service, but you are welcome to use the washer/dryer in the unit if you are renting 1205 or 1205/06. If you are renting 1206 only, you are welcome to use the coin operated washers by the 2000 building. If you have an interim clean included with your reservation we will launder the linens during the clean. Please do not leave personal laundry in the washer when housekeeping is coming for the interim clean. The view was fantastic the amenities were great it was an excellent location . 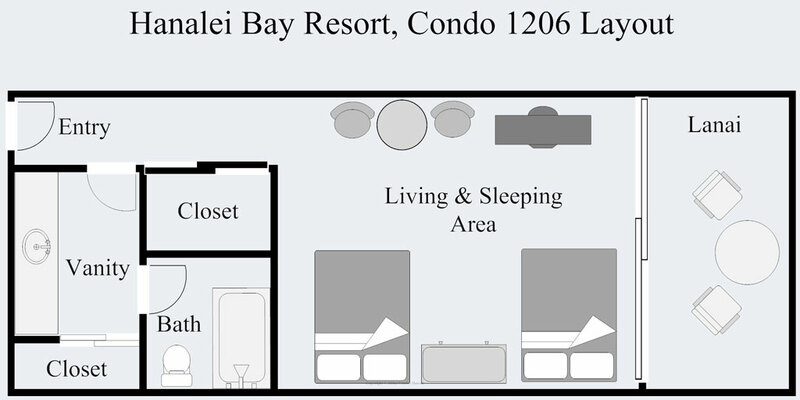 The Hanalei Bay Resort unit 1206 with two queen beds can accommodate up to 4 people at reasonable rates! It features mountain and pool views, tiled floors, a large flat screen TV and DVD player, and private lanai. This second floor unit is one of the most conveniently located units near the parking lot. Close to the pool, hot tub and tennis courts. Located in the Hibiscus building of Hanalei Bay Resor, conveniently on the second floor just steps from the parking lot. Studio unit with two double beds, full bath and fully stocked kitchenette. Can sleep four. We enjoyed the Hanalei Bay Resort property. The pool area was really pretty although we had wished that the pool was heated as it was at the Marriott in Poipu where we stayed the first week. Additionally, we were disappointed that the main restaurant onsite was under construction and not open, but did enjoy the live music at the bar and grill by the front desk. We thought the room could use some updating, but had a great view from the lanai. Our favorite part of the Resort was the sand bottom hot tub. Thank you for taking the time for sending us a review for unit 1206 at the Hanalei Bay Resort. Yes there are lots of pools at resort/complexes that are not heated but the bigger resorts like the Marriott can support the hugh electric bills. The main restaurant that used to be on the property years ago is not open and there is no future plans as of now of it opening. It has not been open since 2011 so it is not considered an amenity at this point. We are glad that you did enjoy the bar/lounge restaurant and music though. Units at the Hanalei Bay Resort that are privately owned can be very different in the decor choices. We do post on the websites an abundance of pictures so that each guest can decide if this unit, its decor and finish choices are right for them. Updating is a matter of each individual owners tastes. Séjour de bonne qualité dans ce studio. Le cadre est magnifique et les prestations du Resort sont excellentes. Une petite réserve par rapport à l'annonce, il est mentionné une cuisine mais il n'y en a pas : pas de plaque de cuisson, pas de micro-ondes, pas de bouilloire et très peu d'ustensiles de cuisine.Très bon souvenir sur un plan général. Really nice place to stay. Clean and well-kept grounds. I especially like that we had beach access a short walk down the road. From the beach, one can walk around the corner, wade across the Hanalei River, and walk into Hanalei town. Only negative is the rough rocks on the bottom of the pool. Smooth out those rocks and the place is perfect!!! Thank you for the great review and taking the time to post. Thanks for noting the cleanliness and the well kept grounds. We are so glad you enjoyed and do hope you can come again soon! Room 1206 had everything we needed for a perfect stay on the north shore of Kauai. We stocked the fridge with beer, snacks, and stuff to make breakfast and sandwiches. Every morning we packed up the cooler they provided and headed out to the beach. They also provide beach chairs! The resort has a nice communal BBQ area where we grilled up steaks for dinner. The bed was comfortable, the AC worked great, and the view from the room was breathtaking. The room was close to the lobby and the pool and the shuttle down to the beach was so convenient. Aloha condos provided excellent service and they were super helpful. We can't wait to return! Thank you for the great review! It is much appreicated. We are so glad to hear you enjoyed your stay and found all that you needed and enjoyed the wonderful views. We do hope you can return for another stay! Thanks for the great review! We are so glad you found the condo to be clean, comfortable and a perfect Holiday for you! The views are incredible and the location is right where you want to be. We do hope you can come again soon! The room was as described and suited us quite well. The view was beautiful and we loved having our morning coffee on the lanai and listening to the music from Happy Talk lounge in the evening.A few things that need attention: the bed closest to the door is tired and needs to be replaced, the wooden hanging rod on the wall behind the door in the bathroom is not secure and cannot be used, and the vinyl shower curtain really needs to be cleaned/refreshed.Other than that we really enjoyed our time there.Thank you! We enjoyed staying in 1206. The location was perfect and close to the parking lot, pool, and hot tub. Yet, it still had a great view and was quiet. The condo itself had some chairs for the beach which were nice to use. The golf cart access to the beach was lovely as we had surfboards and easier to take a ride there than walk with the boards and chairs. We are fond of Hanalei Bay Resort for its access to the beach, tennis court, live music at restaurants, pool/hot tub area, and views. We will be back. my wife and I stayed in unit 1206 for 4 days. What a fabulous view we had from the bed through the window!The apartment was very nice anreven had the basics to make tea and coffee, microwave and mini fridge.The grounds are also very nice with so many trees and plants and all well maintained. The pool area is also very nice even though we never used it.We had a wonderful stay. We read that there were new beds in this "condo". We did not sleep well at all and feel it was a misrepresentation of the beds. Also to put the "kitchenette" in a closet was strange. We love the HBR but would not stay here again. It was a very important 2 day trip and we left tired. We have never had a complaint about these beds! 1206 is a room rental, not a condominium, therefore the microwave and coffee maker in the closet are only for quick snacks and are not for any serious food preparation. The neighbor 1205 rental has those amenities. We are sorry that you did not have an experience that matched other renters. What a beautiful view! Waking up to this view is magical. We were right by the pool (which btw the pool is awesome, love the waterfalls) and right by the parking too. Our favorite part was the short walk to the beach, we snorkeled every morning. I highly recommend Condo 1206, it's a great price. Although I wasn't stoked about having to pay taxes for the cleaning fee, that seemed odd and it seems like a very high cleaning fee for such a small room. But other than that we really enjoyed our time. Remember there isn't a stove or hot plate, only a microwave if you are planning to cook from your room. We would definitely come back again just for that view! We are very happy that you enjoyed both 1206 and Hanalei Bay Resort. We are in agreement with you about the high costs of labor in Hawaii; it is an expensive place to live and wages/costs for cleaning and service are high. We have tried to compensate for this by keeping the rental of the Condo reasonable. Also, the State of Hawaii taxes everything: another cost of living in Paradise. Nevetheless, Hanalei Bay Resort is developing into a premiere resort experience and we are very pleased to share it with you. I also love that magical view from 1206. Thank you for your response to our request for a review from your stay at the Hanalei Bay Resort unit 1206. We are happy you found the unit comfortable, close to beaches and golf and a great value. The 22 acre resort couldn't be in better location and the views from the resort are just amazing! Thanks again. The best feature of this condo is the view from the private balcony. It had everything we needed for a lovely two night stay. The beds are comfortable and it was very clean and quiet. The fridge, microwave, plates etc. were all helpful as we ate in both nights. The bathroom needs updating, but the rest of the condo was in good shape. We had an issue with the a/c unit and Aloha Condos was quick to respond. Although it couldn't be fixed right away they brought us a fan, but we didn't need it as we left the doors open and let the trade winds cool us off. The view off the balcony is magical. Excellent value for the money. Dear Client: Thank you for adapting to the air conditioner failure. We replaced it immediately with a new air conditioner immediately after you left. Otherwise, we are very happy that you enjoyed your stay. This condo was perfect for us. Good condition and there were even beach appurtenances for our use. Thank you for your post and giving a 5 rating. We are pleased to hear the unit was perfect for you. We do try to have extras in the unit like some beach items to make it more convenient. We hope you can come back and join us again. Thank you for your business. Super nice and welcoming people at the resort! Maybe not the best ocean view but still pretty amazing! Also it is just by the jacuzzi that is more than welcome after hiking the Napali coast. Thank you for your rating and staying with us at the Hanalei Bay Resort unit 1206. It is good to hear you found the people to be welcoming and the resort a wonderful place! The view from this unit is just a peek a boo view of the ocean but lovely mountain and garden views. The resort does have lots of great amenities to enjoy all on 22 acres of beautifully landscaped grounds. Thank you again for your review. Great place to stay. Great views from the lanai, quiet and relaxing. We are here usually around Thanksgiving, so we don't need a full kitchen, as we eat at some good restaurants around Hanalei. So the microwave and coffee pot with mini fridge is all we need. The room is comfortable and has what you need. The only drawback is the beds are starting to sag a bit near the edges where you would sit to get in or talk on the phone. But still not a big deal. Love it here. We will always come back. Our favorite resort. Great people, great pool and jacuzzi, just an over all good time. We are very happy that you enjoyed your stay. Will have the beds checked out for replacement. Very agreable,clean,lots of natural light. People were very efficient in answering our demandes such as the wine opener and replacing the DVD. THANKS to Shannon and Larry fix-all men. You will find there a very nice living room outside in beautiful landscape very colorful. We appreciate you taking the time to post a review. Thank you for your feedback with finding the condo pleasant inside and out. We really are there for our guests when any unexpected issues arise and respond immediately and do take it very seriously. We hope you can return again to stay with us. Mahalo for your business! Aloha did a great job sorting through an online booking mistake on my part. Personal and professional! Thank you for taking the time to post your review of your stay at the Hanalei Bay Resort unit 6204. This is a great unit, a great location, and wonderful views! We are glad that we were able to help you with your booking and we do strive to give each guest our personal attention. We hope you can come again in the near future! Thank you for your business. Great value for Princeville. We used the pool and hot tub daily, enjoyed Mai Tai Wednesday, the staff are friendly and helpful, and the AC was a blessing - drowned out the 5am rooster crow wake ups. Stayed in unit 1206 during a business/ vacation trip. Great location. Excellent room for the price! If the restaurant/ lounge were open it would've been perfect! What a wonderful place to be able to stay while traveling on business! The Hanalei Bay Resort is exceptional with the location and amenities. We also hope once again to have the restaurant and lounge available for guests to enjoy. Unfortunately, the restaurants are owned by a private owner over which we have no control. However there are lots of dining choices to choose from in Princeville and Hanalei including a short walk down the bluff to the St Regis. Thank you for the acknowledgement of the reasonable rates we offer for such an exceptional property! Please join us again the next time you visit Kauai! The resort was very nice to say the least. The pool had multiple waterfalls. It was the nicest pool I've ever seen. There was some construction but, it never bothered us. They do it during the day when you're usually not at the hotel anyways. I will stay here next time we come. I liked this resort much better that the hotel that is nearby because it is a lttle more earthy. Built in the 70's, it is very well maintained with goregeous landscaping, pools with waterfalls and a path to the beach. The room is very plain vanilla, could use some bighter wall colors to compliment the outside landscape. The kitchen is actually in the bathroom closet and counter and food prep space is the bathroom sink area. All cooking is done at the outdoor barbeques. There is a microwave and they have a great blender for smoothies. 1206 is essentially a hotel room and does not include a kitchen. We put essentials for minimal cooking (microwave, blender, etc.) in the washroom so that the renters could make snacks. 1205 (which is rented together with 1206 or separately, for less cost) has the kitchen. We painted the walls light gold-yellow to reflect the Kauai sun, to give the room a pleasing and light look, and to enhance the bamboo cabinetry and earthy tile floors. We have found that many people (and importantly, my wife) don't appreciate the "brighter colors." We are glad that you enjoyed our wonderful resort. The most beautiful view in the United States! We have stayed at Hanalei Bay Resort off and on for many years. The view from this resort is incredible! The rooms are big and comfortable. This condos with a kitchen area are even more comfortable. The pool, hot tub, grounds, and tennis courts are well kept and beautiful. The hike down to the beach just adds to the experience of staying in a lush area. The acess to a ride back up the hill is very handy. The ground and cleaning staff were very helpful and friendly. I really miss the restaurant and Happy Talk Lounge. This room has not much different from the others except that it is a very good value for money! Is is clean, comfortable, and offer a view on the garden by the pool.It is very close to the parking lot, which makes it easy to move around, and by the pool as well so it is very convenient. Carefull : by the time of our venue, the restaurant of the hotel (which is nearby) was still under construction. That means noise during the day. We were out all the day so that did not bother us at all!! I must admit with the booking procedure I found all the rules and regulations by the company and owner a bit intimidating, and arrived a bit nervous of setting a foot wrong, however when I arrived I was pleasantly surprised by a gift pack by aloha Condos rental company, and all dealings I had with them were friendly and efficient. Room 1206 is a motel type room (I wouldn't call it a studio as it didn't have a kitchen as such). It had a microwave, toaster and fridge - crockery, cutlery etc in the bathroom/laundry area so it was great to be able to make breakfast or heat up a quick meal. I loved sitting out on the balcony every morning looking at the ever changing view and enjoying the visits of various birds. The unit in parts needed a little bit of attention - some peeling paint on the bathroom door, a lamp switch was a bit dodgy and shower/bath faucet could be improved, but really was not a worry for me, and I found the accommodation comfortable and good value for money. The unit was a little small and dated. Would have enjoyed more color in the decor. Although we didn't spend much there, a bit more room would have been nice. Having to use the bathroom sink for everything was challenging, Next time we would be sure we had a kitchenette. We appreciated having plenty of towels and loved our lanai. The air conditioner, which we only needed at night , worked fine part of the time but there were a couple of nights it didn't seem to be cooling. I would really appreciate having wifi in the room. Wifi at the pool was not always working. We love the resort and want to return when the restaurant is completed. Thank you for allowing us to check in a few hours early. Everything we needed was there. Patio and it's view were lovely. Beds were super comfortable. Good location within resort. Would definitely return! We loved the room, the resort, the gardens, the view, the pools, the tennis courts, the access to the ocean. If anything I would say this place is extremely under-rated and under-marketed. We will be staying here again. The view is over the top! The room is large, bright and airy. Well furnished. The location is perfect-quiet, easy walk to pool and beach. Loved the price! Thank you for allowing me to spend a week in paradise. I travel a lot and I'll be back again and again! Condo 1206 was a great stay. The view of the mountains was spectacularand world class- better than in the photo we saw at booking time. Condo is simple with very nice linens, a good tv and well worth the price. Kitchenette has good amenitiesand with groceries so close it was easy to save moneyon some meals. Proximity to beach, golf, and hanalei is prime. Perfect jumping off point for activities but there is also enoughRelaxation to be had right on site. Hanalei Bay Resort is beautiful and very reasonably priced. Condo 1206 was exactly as you see it in pictures and the view from the lanai is gorgeous. It had all the basics we needed (microwave, toaster, cork screw, etc! )It was perfect for us as it is close to all north shore beaches and less than 5 minutes to Princeville Centre for groceries, gifts, etc. Would definately recommend staying here. Great getaway on the North Shore. Great location to base your North Shore adventures from with the well appointed amenities of the Hanalei Bay Resort. Quiet (except for the roosters), beautiful grounds, convenient to Hanalei, Secret Beach and the Napali Coast. We enjoyed the quiet beauty of the view from the lanai. Checkin was quick and the staff was courteous and helpful. The condo was clean and neat. The kitchenette facilities were just what we needed to prepare our simple breakfasts. The location is only a short drive from Hanalei and the Bay. We enjoyed the large, natural-like swimming pool. We enjoyed the quiet. The mattresses seem to be well past their prime. We planned on camping but this place was recommended to us by a friend. Fast, easy check-in. Clean rooms, million-dollar view from the lanai. Great value. Had a special request for the property manager and the request was handled with ease. Highly recommended. We were very pleased with our stay at the Hanalei Bay Resort, Condo 1206. The location was ideal and the price was right! This condo has easy access to the pool and parking lot and the view from the lanai is hard to beat. Amenities are essentially like a hotel room but there is a microwave, coffee maker, refrigerator and toaster so we were able to do some cooking for breakfast each morning. It's a steep hike back from the beach but the value of this place is incredibly hard to beat. Apparently the restaurant burned over the summer so it was not operational but there are plenty of great places nearby. Enjoy! This room is basically a hotel room being rented as a condo. It has two beds and a small table and 2 chairs. An interior connecting door to the "condo" next door allowed higher levels of noise than would normally be expected. The "kitchen" consists of a microwave and mini refrigerator located in a closet in the bathroom. There is a very early check-out time and an outrageous $90.00 cleaning fee to clean one room and a bathroom. The view from this property is very nice and the grounds of the property are pleasant and well maintained. However, next time we'll just rent a hotel, avoid the cleaning fee, and have a bit more reasonable check out time. between the condos are solid concrete, not allowing noise to penetrate. This "studio" is for one or two people, not a family. The size and amenities for this remodeled, clean, and well-situated studio are very inexpensive compared to any of the hotel rooms in the Princeville and Hanalei area and are a "real bargain". Nice room for a fair price. Small, but comfortable. Well-equipped kitchenette in bathroom, clean with comfortable beds. It's fine if you are just looking for an inexpensive place to sleep at night in Kauai. My wife and I were just trying to get a place near her daughter and family, so I selected this room based on location and rates. The room was considerably beyond our expectations. Beautiful view of well kept gardens and the mountains beyond. Very friendly and helpful staff. A well appointed room (small refrig, microwave, utensils) with a sizable deck. We hope to return to this resort soon. No complaints except we could hear every word the people in the room next door (1205) were saying. It was like there wasn't even a wall between us. Their voices weren't muffled, they were loud and clear. And the people weren't yelling, just speaking in normal voices. We woke up most mornings listening to them talk. Other than that, the room was decent for the price and there's a nice view from lanai (although again, the same privacy issue from the people next door).